Jeff: Welcome to the latest edition of “Who’s Making Money?” Hi, I’m Jeff Biesman and I’m here with Phil Pirio in Los Angeles, CA. Phil is a Senior Plan Design Consultant at Dedicated Defined Benefit Services. Phil: Thanks, Jeff. Hi everyone. Like Jeff said, I work out of our LA office with Financial Advisors & CPAs nationwide to design Defined Benefit and Cash Balance plans for high income self-employed people and small business owners to help them hold on to more of what they earn and plan for retirement. Jeff: Phil, you, Martin and Raymond always seem to get a lot of questions about Defined Benefit and Cash Balance plans largely because some advisors and their clients aren’t as familiar with these retirement plans as they are with more traditional retirement plans. I like this next story because you were able to help a client that was initially very skeptical and wanted to go a more conventional route. Phil: Exactly! 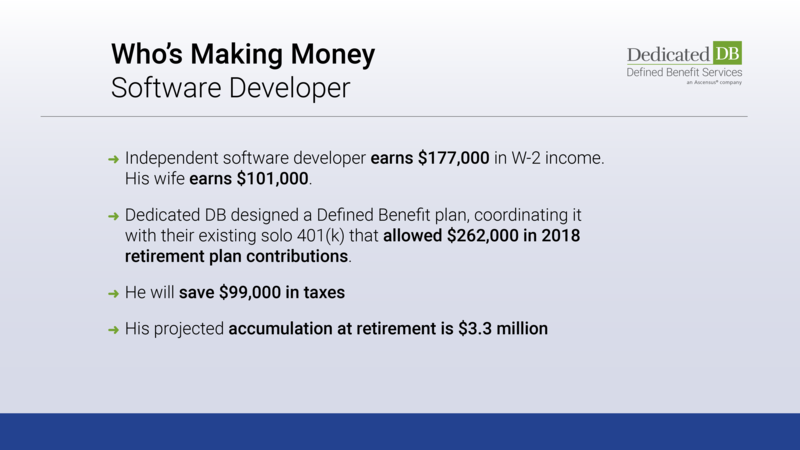 We recently got a call from a very successful 47-year-old self-employed software designer who had heard about Defined Benefit plans but had a lot of misconceptions and doubts. Over the course of multiple phone conversations we were able to convince him that one of our plans, customized specifically for his situation, was far and away the best option that allowed him to keep more of the money he’s making and turbo-charge his retirement. Jeff: I take it there are some common questions you typically get and some myths out there about Defined Benefit and Cash Balance plans. Any examples? Phil: You’re right – there are a bunch of frequent questions and misconceptions about defined benefit plans. This particular client was no different. He was really concerned about having to lock in to the same contribution each year based on what he had heard. Jeff: Yup – that seems to be a huge misconception! Phil: And the reality is that there’s considerable flexibility in terms of what you need to contribute each year. Defined benefit plans are very attractive because they do offer the largest above the line tax deduction which, by the way, can also help you take advantage of the new 199A 20% deduction. But, you’re really not locked in to a specific number! 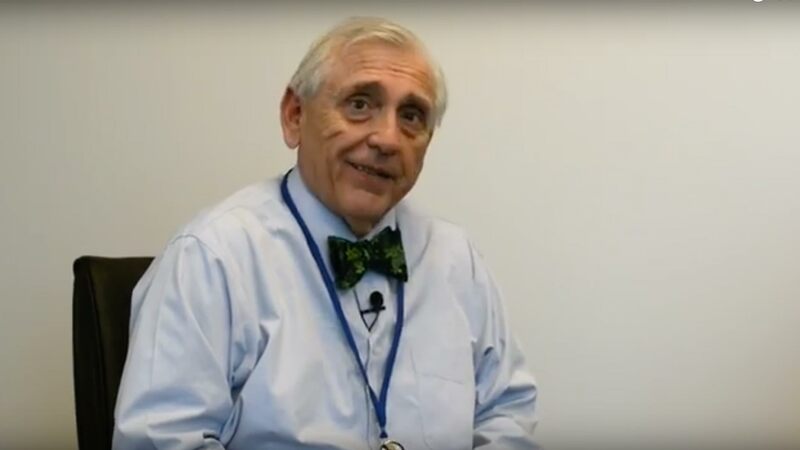 Jeff: I’m sure there are other misconceptions because defined benefit plans aren’t necessarily as heavily marketed as other retirement and tax saving options, right? Phil: Definitely! For example, another misconception is that Defined Benefit retirement plans are only suitable for large corporations or businesses with a lot of employees as a pension program. The truth of the matter is that defined benefit plans are even better suited for Owner, Owner/Spouse businesses and are not liable or “on the hook” for anyone’s pension but their own. Therefore, allowing the client to change their contribution/benefit to a lower amount if they ever needed to. Jeff: In reality, defined benefit plans really make sense for a small business owner or high-income self employed person. What other misunderstandings do you typically deal with when talking to a business owner or advisor about defined benefit plans? Phil: There’s the SEP misunderstanding. Most clients and some advisors are under the impression that the IRS allows them to fully fund a SEP and a Defined Benefit plan in the same year. Though I wish that were the case — it would make my job a lot easier — it is unfortunately not true. If the client is funding their SEP using IRS Form 5305, they are not allowed to fund a Defined Benefit Plan or 401(k) plan. The client will have to back the SEP assets out for that year or wait until their next fiscal year to start the DB plan. Jeff: Given the advantages of a defined benefit or cash balance plan it probably makes sense to call us first, before funding a SEP. Any misconceptions that come up now that we have a new tax law? Phil: Yes! It’s actually quite surprising to most advisors and their clients that a defined benefit plan actually becomes an even more effective tool post HR1. In fact, one of our plans could actually help a client lower their AGI enough to take advantage of the new 20% deduction available to certain small businesses that are pass through entities. This is basically an additional 20% tax break that wasn’t there before and a defined benefit plan can make a huge difference in qualifying for it. Jeff: Phil, this has been really, really helpful. I’ve got a pretty good understanding of defined benefit plans but I even learned a lot talking to you today! Anything else? Phil: Yes, Jeff. Last thing: If you’re an advisor, small business owner or high income self-employed individual with questions about defined benefit or cash balance plans please give us a call. With the new tax law, these plans are gaining momentum and more popular than ever. We are here to help and talking to us early increases our ability to help you set up a high contribution retirement plan this year and look at the potential to reduce tax liability even more. Jeff: Thanks Phil! Well, that’s it for now. We’ll see you next time on “Who’s Making Money”.